Kick off your visit on the 1st (Tue): admire the masterpieces at Neues Museum, pause for some photo ops at The Holocaust Memorial - Memorial to the Murdered Jews of Europe, then ponder the world of politics at Reichstag Building, and finally make a trip to Brandenburg Gate. On your second day here, test your problem-solving skills at popular escape rooms, get the lay of the land with Walking tours, then pause for some photo ops at Victory Column (Siegessaule), and finally explore the galleries of Gropius Bau. For where to stay, reviews, traveler tips, and more tourist information, you can read our Berlin trip planner . If you are flying in from Germany, the closest major airports are Berlin-Tegel Airport and Berlin-Schönefeld Airport. Finish your sightseeing early on the 2nd (Wed) so you can drive to Prague. Prague is known for historic sites, nightlife, museums, fun & games, and zoos & aquariums. Your plan includes some of its best attractions: take a stroll through Old Town Square, pause for some serene contemplation at Infant Jesus of Prague, let your taste buds guide you at a local gastronomic tour, and contemplate in the serene atmosphere at Spanish Synagogue. For reviews, photos, where to stay, and other tourist information, go to the Prague planner . Drive from Berlin to Prague in 3.5 hours. Alternatively, you can fly; or take a train. In October, daytime highs in Prague are 15°C, while nighttime lows are 7°C. Wrap up your sightseeing on the 5th (Sat) early enough to travel to Budapest. Budapest is known for historic sites, spas, nightlife, museums, and nature. Your plan includes some of its best attractions: ponder the world of politics at Parliament, get the lay of the land with Walking tours, indulge in some culinary diversions at a local gastronomic tour, and head off the coast to Margaret Island. To see more things to do, photos, and other tourist information, use the Budapest trip app . Traveling by flight from Prague to Budapest takes 4.5 hours. Alternatively, you can drive; or take a bus. In October, daily temperatures in Budapest can reach 19°C, while at night they dip to 7°C. Finish up your sightseeing early on the 8th (Tue) so you can travel to Rome. You'll discover tucked-away gems like Roman Forum and Duomo di Orvieto. Get out of town with these interesting Rome side-trips: Civita di Bagnoregio (in Civita di Bagnoregio) and La Torre dell'Orologio (in Sutri). There's still lots to do: delve into the distant past at Colosseum, steep yourself in history at Palatine Hill, explore the world behind art at Vatican Museums, and take a stroll through Trastevere. To find more things to do, maps, traveler tips, and more tourist information, refer to the Rome tour builder website . You can fly from Budapest to Rome in 5 hours. Alternatively, you can drive; or take a train. Traveling from Budapest in October, expect Rome to be a bit warmer, temps between 26°C and 15°C. Wrap up your sightseeing on the 12th (Sat) to allow time to take a train to Florence. You'll discover tucked-away gems like Piazza del Duomo and Basilica San Miniato al Monte. Explore the numerous day-trip ideas around Florence: San Gimignano (San Gimignano Bell Tower & Historic Centre of San Gimignano) and Wine Tours & Tastings (in Siena). Next up on the itinerary: explore the world behind art at Uffizi Galleries, examine the collection at Academy Of Florence Art Gallery, appreciate the extensive heritage of Centro Storico, and pause for some serene contemplation at Cathedral of Santa Maria del Fiore. To find ratings, more things to do, maps, and more tourist information, use the Florence trip planner . Take a train from Rome to Florence in 2 hours. Alternatively, you can drive; or fly. In October, daytime highs in Florence are 25°C, while nighttime lows are 14°C. Wrap up your sightseeing on the 16th (Wed) to allow time to travel to Barcelona. Explore Barcelona's surroundings by going to Vila Vella (Old Town) (in Tossa de Mar) and Fenals Beach (in Lloret de Mar). There's still lots to do: admire the landmark architecture of Basilica of the Sagrada Familia, indulge in some culinary diversions at a local gastronomic tour, make a trip to Ciutat Vella, and take a stroll through El Barri Gòtic. To see photos, traveler tips, where to stay, and tourist information, refer to the Barcelona trip planner. You can fly from Florence to Barcelona in 5 hours. Alternatively, you can do a combination of train and flight; or drive. Traveling from Florence in October, you can expect nighttime temperatures to be a bit warmer in Barcelona, with lows of 18°C. Wrap up your sightseeing on the 19th (Sat) to allow time to take a train to Madrid. You'll discover tucked-away gems like Alcazar de Segovia and Catedral de Segovia. Go for a jaunt from Madrid to Toledo to see Mirador del Valle about 1h 25 min away. There's lots more to do: see the interesting displays at Prado National Museum, make a trip to Plaza de Oriente, stroll through Retiro Park, and explore the world behind art at Royal Palace of Madrid. You can plan Madrid trip in no time by asking Inspirock to help create your itinerary. Take a train from Barcelona to Madrid in 3 hours. Alternatively, you can fly; or drive. Plan for little chillier nights when traveling from Barcelona in October since evenings lows in Madrid dip to 13°C. Cap off your sightseeing on the 22nd (Tue) early enough to travel to Lisbon. You'll explore the less-touristy side of things at Obidos Village and Cabo da Roca. Change things up with a short trip to Castelo dos Mouros in Sintra (about 42 minutes away). And it doesn't end there: wander the streets of Belém Tower, steep yourself in history at Jeronimos Monastery, make a trip to Praca do Comercio (Terreiro do Paco), and explore the historical opulence of Castelo de S. Jorge. For reviews, traveler tips, and tourist information, read our Lisbon road trip site . Getting from Madrid to Lisbon by flight takes about 4.5 hours. Other options: drive; or take a bus. You'll gain 1 hour traveling from Madrid to Lisbon due to the time zone difference. In October, plan for daily highs up to 28°C, and evening lows to 17°C. Cap off your sightseeing on the 25th (Fri) early enough to travel to Dublin. You'll explore the less-touristy side of things at Walking tours and Smithwick's Experience Kilkenny. When in Dublin, make a side trip to see St. Canice's Cathedral & Round Tower in Kilkenny, approximately 2 hours away. The adventure continues: see the interesting displays at Kilmainham Gaol, explore the world behind art at Chester Beatty Library, browse the collection at Marsh's Library, and indulge your thirst for a good beer at Guinness Storehouse. To find where to stay, more things to do, maps, and tourist information, read our Dublin online vacation planner . Traveling by flight from Lisbon to Dublin takes 6 hours. Alternatively, you can do a combination of car and ferry; or take a bus. Traveling from Lisbon in October, expect Dublin to be a bit cooler, temps between 16°C and 8°C. Finish your sightseeing early on the 29th (Tue) so you can travel to Edinburgh. Step off the beaten path and head to Royal Yacht Britannia and Arthur's Seat. When in Edinburgh, make a side trip to see Rosslyn Chapel in Roslin, approximately 30 minutes away. There's much more to do: examine the collection at National Museum of Scotland, wander the streets of Edinburgh Old Town, pause for some serene contemplation at St Giles' Cathedral, and get curious at Camera Obscura and World of Illusions. For photos, where to stay, maps, and tourist information, go to the Edinburgh travel route planning tool . Getting from Dublin to Edinburgh by flight takes about 4.5 hours. Other options: do a combination of flight and train; or do a combination of bus and flight. October in Edinburgh sees daily highs of 15°C and lows of 7°C at night. Finish your sightseeing early on the 2nd (Sat) so you can travel to London. London is known for museums, nightlife, shopping, historic sites, and parks. Your plan includes some of its best attractions: step into the grandiose world of Buckingham Palace, admire the masterpieces at National Gallery, get engrossed in the history at Westminster Abbey, and get a new perspective on nature at Natural History Museum. For where to stay, traveler tips, ratings, and tourist information, read London trip itinerary app . You can fly from Edinburgh to London in 3.5 hours. Other options are to do a combination of flight and train; or drive. Expect somewhat warmer evenings in London when traveling from Edinburgh in November, with lows around 5°C. Finish your sightseeing early on the 6th (Wed) to allow enough time to take a train to Paris. 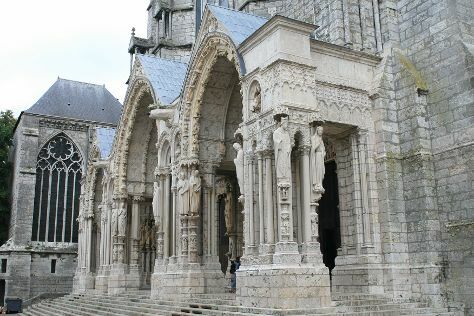 You'll find plenty of places to visit near Paris: Palace of Versailles (in Versailles) and Chartres Cathedral (in Chartres). There's lots more to do: steep yourself in history at Eiffel Tower, pause for some serene contemplation at Basilique du Sacre-Coeur de Montmartre, admire the masterpieces at Musee d'Orsay, and head off the coast to Île de la Cité. For ratings, maps, traveler tips, and tourist information, read Paris trip app . Traveling by train from London to Paris takes 2.5 hours. Alternatively, you can fly; or drive. The time zone difference when traveling from London to Paris is 1 hour. Expect a daytime high around 12°C in November, and nighttime lows around 6°C. Finish your sightseeing early on the 10th (Sun) so you can take a train to Amsterdam. Amsterdam is known for museums, nightlife, parks, breweries & distilleries, and shopping. Your plan includes some of its best attractions: admire the masterpieces at Van Gogh Museum, get engrossed in the history at Anne Frank House, see the interesting displays at Zaanse Schans, and tour the pleasant surroundings at Vondelpark. For other places to visit, photos, and tourist information, refer to the Amsterdam trip itinerary builder tool . Traveling by train from Paris to Amsterdam takes 3.5 hours. Alternatively, you can fly; or drive. Expect a daytime high around 12°C in November, and nighttime lows around 5°C. Finish up your sightseeing early on the 13th (Wed) so you can travel back home.